In the middle of the 20 th century, the archdiocese finally came under the leadership of Filipino bishops. He served from 1974 to 2003. He presided at very significant events which led to a reinvigoration of the faith and of a deeper assessment and evaluation of the life of the local Church. In 1979, he convened the Fourth Synod of Manila which saw, for the first time, the active and full-fledged membership of the laity in an archdiocesan synod. In February 1981, the country was blessed with the visit of Pope John Paul II who presided over the grace-filled event of the beatification of Lorenzo Ruiz who, in 1987, would be canonized as the first Filipino saint. In April of the same year, the Manila Cathedral was elevated to a Minor Basilica. He served from 1953 to 1974. 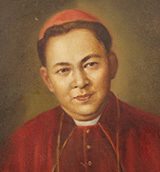 He succeeded Archbishop Reyes and held the distinction of being the first Filipino cardinal. 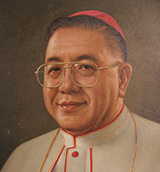 Cardinal Santos paved the way for the establishment of Catholic Charities, St. Paul Hospital (now the Cardinal Santos Medical Center ). 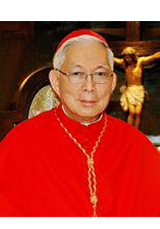 He also re-established the Philippine Trust Company and the Catholic Travel Office. During his term, the Manila Cathedral, which was damaged by World War II, was reconstructed and dedicated to the patronage of the Immaculate Conception on December 10, 1958 . It was also during his term that His Holiness Pope Paul VI made a pastoral visit to the Philippines, the first ever by a Supreme Pontiff in the history of the Philippine Church. The Holy Father’s journey was also occasioned by the Asian Bishops’ Meeting, which was graced the presence of the Holy Father himself. 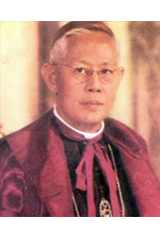 He is the first Filipino Archbishop of Manila, served from 1949 to 1952. 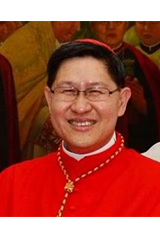 Among his tangible achievements were the establishment of the San Carlos Seminary and the parochial schools. His vision to build a Catholic center was realized by his successor with the building of the Pope Pius XII Catholic Center on U.N. Avenue in Manila .